After more than fifty years of good health, anthropologist Paul Stoller suddenly found himself diagnosed with lymphoma. The only thing more transformative than his fear and dread of cancer was the place it ultimately took him: twenty-five years back in time to his days as an apprentice to a West African sorcerer, Adamu Jenitongo. Stranger in the Village of the Sick follows Stoller down this unexpected path toward personal discovery, growth, and healing. The stories here are about life in the village of the healthy and the village of the sick, and they highlight differences in how illness is culturally perceived. In America and the West, illness is war; we strive to eradicate it from our bodies and lives. 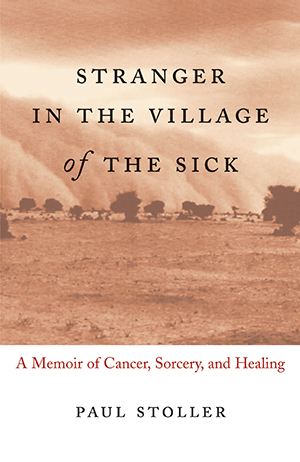 In West Africa, however, illness is an ever-present companion, and sorcerers learn to master illnesses like cancer through a combination of acceptance, pragmatism, and patience. "[A] fascinating blend of personal and cultural commentary, of provocative insights, and encouraging advice for anyone affected by cancer . . ."
"Today one finds a variety of cancer drugs under trial or approved for use . . . But there is still a gap between what medicine can do now and what it will do in the future. And Stoller's book is a bridge over that gap because it reminds all patients that, in the face of illness, their lives are rich in meaning and still worth living." "Readers will find Stoller's account valuable and his perspective on sorcery surprisingly moving."